These are the first peaches off the tree in early summer. Best for jam, slicing with ice cream, dribbling off your chin. A true cling, don't try to quarter them for canning. Nice fresh eating peach. 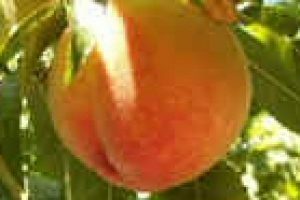 It ripens early in the season and is usually freestone, although some years it can be a little 'clingy'. It has a wonderful red color over a yellow background. The flesh is yellow with a little red near the pit. It is juicy, sweet, and very tasty.